The Mary Betty Stevens Young Investigator Prize memorializes Dr. Stevens’s outstanding contributions to lupus research. It is given annually to recognize the remarkable accomplishments of an investigator in the early stages of their lupus research career. 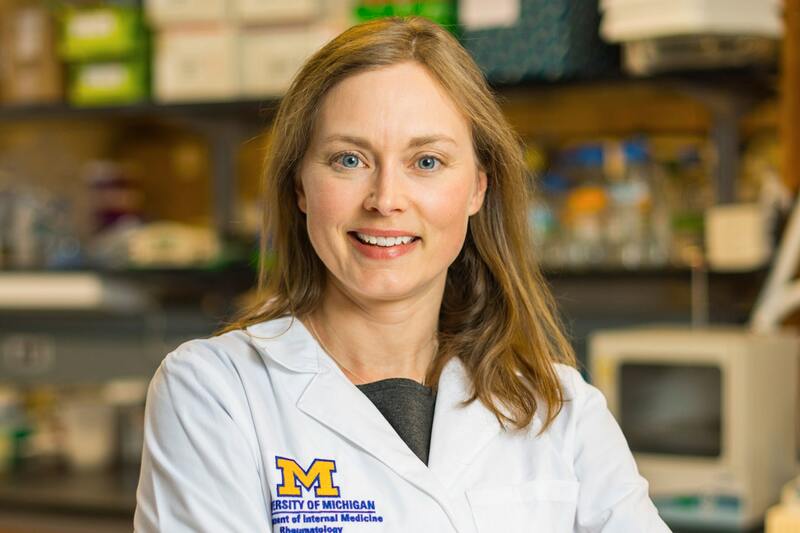 J. Michelle Kahlenberg, MD, PhD, a physician scientist and associate professor at the University of Michigan, is the latest recipient of the Mary Betty Stevens Young Investigator Prize. Dr. Kahlenberg received the honor at a reception during the 2018 ACR/ARHP Annual Meeting. Dr. Kahlenberg’s contributions to the study of lupus-related skin diseases include being principal investigator for a study analyzing how certain chemicals contribute to inflammation of the skin and how those chemicals regulate inflammation in response to ultraviolet light. Additionally, Dr. Kahlenberg and her team have found gender differences in response to ultraviolet light in mice. The team is exploring the role of interferon kappa (IFN kappa) in modulating skin bacterial colonization. Among humans, she says, “Women have a more robust interferon response, particularly for IFN kappa.” These studies may help explain why women are at higher risk of developing lupus and, perhaps, reveal factors that lead to a systemic autoimmunity. The prize is only latest in a succession of academic awards for Dr. Kahlenberg. She was an Eng Tang Scholar and a Vic and Kelly Braden Memorial Fellow for the Arthritis National Research Foundation. She was named an ACR Distinguished Fellow, and she was awarded an ASCI Young Physician Scientist award in 2015. She also received the Edmund L. Dubois Memorial Lectureship in systemic lupus from the Rheumatology Research Foundation during the 2017 ACR/ARHP Annual Meeting.